Last night I checked into the blog and was shocked to see it had been viewed 81,000 times! I have shared a fair amount about different projects and aspects of planning my wedding, but there is always more to write about. After sharing the blog on Facebook a friend from college reached out and asked for ways to save when planning a wedding. So of course my wheels start turning and I am suddenly up at 4am not able to sleep thinking of a new blog post to write. These are tips I have learned from planning my wedding, watching some bridal TV shows, reading, and talking to other people who have planned weddings. The most important thing to keep in mind is know what you want and what you are willing to sacrifice. If you want to celebrate with family and friends and aren't much of a dancer maybe you forgo a longer reception and DJ to save money on the venue and music. 1) Budget- The number one thing is to know who is paying and how you will be paying for your wedding. Create a budget and stick to it. 3) Time of Year- Most people know late spring and early fall tend to be more expensive. Winter months are typically cheaper. Some people know the exact date they want to get married, and some might decided to choose based on venue availability or what the weather will be. If you are looking to save a little money, maybe choose an off season month. Just keep in mind that you want to accommodate guests and their busy schedules. 4) Day of the Week and Time- Saturday is the most popular day to get married. If you aren't dead set on getting married on a Saturday, consider a Friday or Sunday wedding. Some people also choose an earlier wedding such as a brunch to save money. Most venues will host 2 events in one day so if you are willing to do an earlier time, you could really save some money. 5) Save the Dates- Save the dates can be a fun way to announce your wedding date, but they can also save you money if you don't use them. Think of a fun alternative to letting people know your upcoming wedding date. I'm not suggesting you do what Anne Hathaway did in Bride Wars (typing a quick email with a bunch of spelling mistakes and hitting send before proof reading!) If you really want to send out that cute engagement photo and guarantee a spot on your friends' fridge, you could make your own in publisher and print at a local print shop or create them on a website like shutterfly and wait for a great coupon. Often times shutterfly or snapfish will send out 50% off or coupons around holidays like Fathers day, and Valentines day. If you want to wait for a coupon, just make sure you have the save the date ready to go because the coupon may only be good for 1 day and you don't want to rush to get it made. Another thought is to send them out with Christmas Cards, or hand deliver to a few people that live close by to save money on stamps. You could only send them to out of town guests who you know will need to plan ahead with work and travel schedules. 6) Food- Going into planning our wedding we thought for sure we would have a buffet. We thought it would allow our guests to choose what they want right there in the moment. When meeting with the caterer we learned that it is slightly more expensive to do buffet style and here's why: The caterer does not know how much each guest will want to eat, if they will come back for seconds or even thirds. They don't know which dish will be most popular, so they have to over prepare a little of everything. So we decided to go with plate service and have our guests tell us what they wanted ahead of time to save a few bucks! We also saved a few hundered dollars, by eliminating the cheese and veggie spread during cocktail hour, and chose just to have butlered hors d'oeuvres. 7) Drinks- Some venues have a bar service and you are required to use them. Often times there will be an up charge for top shelf liquor. When creating your menu and signing contracts make sure you read the fine print and don't sign that guests can request top shelf brands. Some places won't have bar service and you will have to provide the drinks. This is where you can save money by having just wine and beer and 1 or 2 signature cocktails. You can buy beer and wine in bulk, shop ahead of time and buy things when they are on sale or when there are coupons, and buy less expensive brands. Honestly, there is one thing that kills a party: no drinks or a cash bar. However, you know your guests the best, if you aren't going to have that type of crowd you can go the route of a cash bar (or 2 tokens for drinks then pay cash) or no alcoholic drinks to save money. Just remember- you are trying to have the time of your life and show your guests a good time! 8) Bridal Party- Bridal party size can affect your price. Yes, typically the bridesmaids will pay for their own dress, jewelry and shoes, and the groomsmen will pay for the rental of their tux or buy their own suit. But keep in mind the bigger the bridal party size, the larger the transportation vehicle (limo, party bus) you have to rent (cha-ching $$$ more money you are spending.) The bigger the bridal party size, the more gifts you are buying (cha-ching $$$ more money you are spending.) The bigger the bridal party size, more bouquets and more boutonnieres you are buying (cha-ching $$$ more money you are spending.) Identify who you want by your side during that day and make sure it's a number you are able to handle. 9) Asking your bridal party- A modern trend is the way people are asking their friends and family to be in their wedding. If you want to save money on your wedding (just ask!) You don't need to send a personalized bottle of wine with other gifts. You can also think of cheaper and creative alternative ways to invite them into your bridal party. 10) Wedding Dress- When I watch say yes to the dress my jaw drops half the time because people's budgets are out of this world! They are willing to spend $10,000-20,000 just on the dress!! I don't know about you, but I had a budget and stuck to it. Yes, this is the most important dress you will wear in your life and you want it to be everything you ever imagined, but don't break the bank! Shop at trunk shows, opt for a more simple gown and add a nice beaded belt, avoid custom alterations, keep an eye out for bridal shop sales, buy a gown from another bride (some people might have bought a gown and changed their mind and are now trying to sell their gown online,) buy a floor sample or rent your dress. Don't try on a dress that is out of your budget- because if you love it, chances are you will talk yourself into it. Go shopping with people you trust and know won't talk you into something you can't afford. 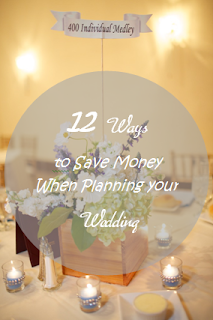 11) Time- When trying to save money on your wedding, time is a big factor. If you are rushed with planning you may be forced to choose the last venue, florist, etc. available and may not have the choice on saving. When you have more time, you can be on the lookout for sales and coupons. 12) Guest List- The bigger the guest list, the more money you will be spending (meals can cost upwards of $85-100 a plate!) As a couple write out who you want included in your big day and try to agree on a number that is reasonable. Chances are you don't need to invite your second cousins best friend and her boyfriend. Hope those are helpful to you!